Frugal living using extreme couponing to buy pounds of healthy food for only pennies on a budget of $50.00 a week for a family of five. I have not gotten much sleep lately so this is going to be a short post. I am just too tired today. Maybe I can update this tomorrow. -Final $0.42 each *Stock up Price! I spent $12.48 and saved $17.69 on $30.17 worth of Groceries. I got lots of freebies this week. This really helps stretch my budget. I spent $23.21 and saved $18.12 on $41.33 worth of groceries this trip. I was disappointed the Barrilla Plus was not on sale at Kroger this week since I have 5 coupns for them. I am starting to get low on pasta. I can only hope Tom Thumb will come through and put it on sale. I only have one computer so I can only print two. I didn't plan on buying the Kcups either, but they were such a good price. I bought all the coupons I had. I have been wanting comfort food lately. I am trying to get a few casseroles in before the kitchen is closed for summer. It is just way to hot to cook inside during the summer. 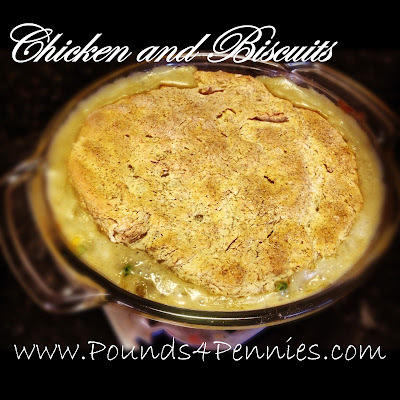 Here is another under five dollar dinner and a great stockpile meal Easy Chicken and Biscuits. I wanted to make some chicken stock for some beans I was planning on cooking later in the week. I boiled a bone in chicken breast with seasonings. This is like the canned chicken you normally buy, but not nearly as expensive. I used the stock for some beans I was cooking to put up and freeze. I had no idea what I was going to do with the chicken. I put it in the fridge and started going through some recipes to see what I wanted. Since the chicken was in the fridge it was so easy to cut up it just fell off the bone. This dish originally started off as Chicken pot pie, but I just didn't feel like making the crust. 1. Saute the onions in a little butter or oil until they are translucent. 2. Add cubed chicken, soup, 1/4 cup milk, mixed veggies, frozen veggies. Heat this mixture through. Pour this into a round 2 quart casserole dish. 3. Make the biscuits for the topping. In a large bowl add biscuit mix and milk stir until lumpy. Spread biscuit mixture over the top of the round dish. 4. Place in oven at 350 for 30 mins. Top should be golden brown when the Chicken and Biscuits are removed. 5. For a slight variation to this recipe add 1/2 cup of cheese to the biscuits for a cheesy biscuit top or drop biscuits on top. This is super easy chicken and biscuit meal that you can whip up for you family in no time. This meal cost me around $3.50 to make to feed my family of five. The prices reflect my stockpile price for these items. This is another under five dollar dinner you can make to feed your family. Everyone in my house loved it. There were even a few leftovers for the next day. Want to save money on this meal? Click here to print coupons for butter, margarine and oil and more. Link up any Craft or Recipes you would like to share. Linky Party is now open! Do you want to save more money at Walmart? You can price match any item with another stores ads, including groceries. Some people seem intimidated by doing this since they don't know how. I am here to walk you through how to price match Walmart and share the policy with you. Grocery ads are usually mailed to you Tues or Sat. Scan these flyers for items you would buy, then see if you have a coupon to match. A good match up site you can go to is debt free spending. Find the items you want to purchase and the quantities before you go to the store. Having a plan is key to saving money. You are less likely to impulse buy things you don't need if you have a plan. Collect and have all your coupons ready before you get to the store. Get organized before you checkout mark which circulars you are going to use for each item. A good idea is to group products of similar stores together so it is easier for the cashier to check you out. Let the cashier know you have price matches when they start to check you out. Ask them nicely how would they like to handle price matches. Then match your items and let them know you have coupons. The only time this is not good is if you have a store that doubles or triples coupons. Even if you don't have coupons this is an awesome way to save a ton of money on your groceries. Just think you are getting the best price at from two to three stores by just shopping at one store. What a way to maximize your savings! Walmart will honor a Buy one Get One FREE (B1G1 or BOGO) deal if the price is marked in the ad. However, if the price is not listed in the ad, Walmart will not honor a B1G1 deal. They will not honor a percentage off and item or close out or going out of business prices. Click for a complete copy of the Walmart's Price Match policy. Join my community for FREE Coupons & DEALS! Affiliate links may be used in the above post. I may be compensated for clicking links listed above. © 2011 Pounds 4 Pennies – All rights reserved. –. Awesome Inc. theme. Theme images by molotovcoketail. Powered by Blogger.